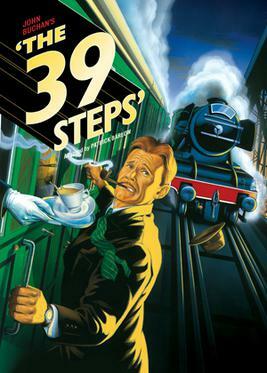 Dragonfly will be holding auditions The 39 Steps, a hilarious adaptation of Hitchcock's thriller. The play tells the story of a man with a boring life who meets a woman with a thick accent who says she's a spy. When he takes her home, she is murdered. Soon, a mysterious organization called "The 39 Steps" is hot on the man's trail in a nationwide manhunt that climaxes in a death-defying finale. The company is seeking actors of all ethnic and racial backgrounds to play exciting, funny, and versatile characters. Play will be performed at Woodbridge Middle School. Those auditioning will be asked to read scenes from the play. There are sides available for download on the audition page of the Dragonfly web site, www.DragonflyArtsNJ.com/auditions. Richard Hannay, Male, 25-55: Upper-class Englishman, handsome, square-jawed leading man, quite aware of how attractive he is. British RP accent. Any Ethnicity. Pamela/Annabella, Margaret: Female, 20-40: One actress will play all three roles, including Pamela, the classic Hitchcock leading lady. German/Scottish/British accents. Any Ethnicity. Clown 1 & Clown 2: Male or Female, 18+: Must be superb comedic actors who will play many roles with many accents. One clown can be a woman. Any Ethnicity. The company is also seeking a stage crew, set creators, and a stage manager.